After properly setting up your Linksys Wi-Fi Router, you can now add computers and other devices to your network using the Linksys Connect software. Linksys Connect is a step-by-step setup wizard that will have your networking devices connected wirelessly in minutes. It also offers powerful tools for managing your wireless network such as Security settings, Guest access, Parental controls and Advanced settings. Launch Linksys Connect on your main computer. If you’re using a Windows computer, go to Start > All Programs > Linksys Connect. To launch Linksys Connect on a Mac® computer, navigate to the Applications folder in Go, and then start Linksys Connect. 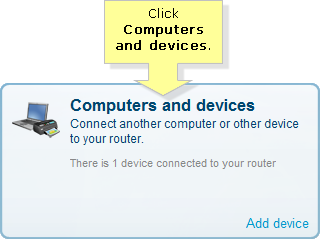 On the main Linksys Connect screen, click Computers and devices. When the Computers and other devices screen comes up, click Computer. On the Do you have an Easy Setup Key? screen, select I want to connect manually using my wireless settings. Click Next. QUICK TIP: The Easy Setup Key will not work on computers without wireless capability. If you want to connect wirelessly, you may need to add a wireless adapter to your computer like a Linksys wireless USB adapter. If not, you can connect the computer via an Ethernet cable. Take note of the wireless settings. You will need these to connect your wireless devices to your network. Then, click Next. Follow the instructions on the Connecting another computer screen. Then, click Next. NOTE: Make sure to disable any third-party wireless utility installed on the additional computer so you won’t encounter any installation issue. Wait until the Linksys Connect software detects the computer you want to add. Once the computer is detected, click Next. 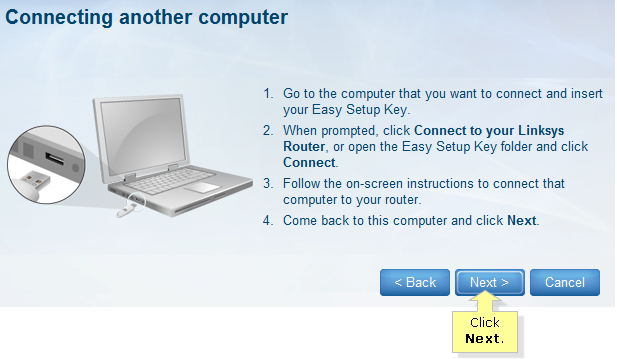 On the computer that you’ve just added to the network, install the Linksys Connect software and follow the on-screen instructions. You should now be able to access the Internet on your computer. 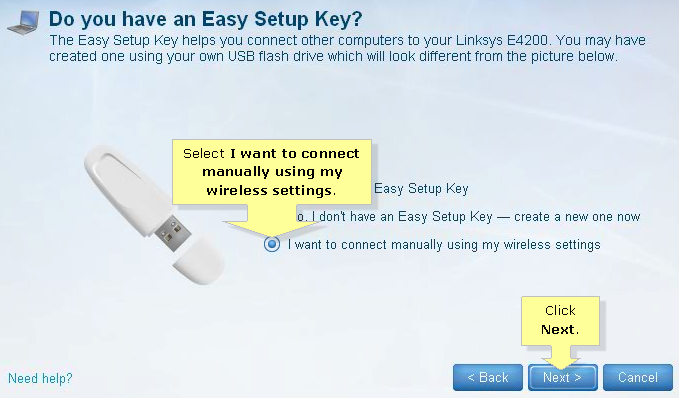 NOTE: If you’re still unable to connect your computer to the wireless network using Linksys Connect, you may also choose to connect the wireless computer manually. To learn how, click here. If the computer you wish to add doesn't have wireless capability, you can connect it using an Ethernet cable. Your Linksys Wi-Fi Router comes with an Ethernet cable. Additional Ethernet cables can be easily purchased from your local computer store. Make sure that the Ethernet cable you purchase is long enough to connect your devices. Connect one (1) end of the Ethernet cable into the Ethernet port of your computer. Connect the other end of the Ethernet cable into any of the numbered Ethernet ports at the back of your Linksys Wi-Fi Router. Ethernet cable - Make sure that the Ethernet cable is not defective or broken. 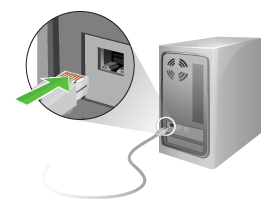 Computer’s network adapter - Make sure that the network adapter is enabled. Disable and enable your network adapter to reset it. IP Address - If you have set a static IP Address on your computer, it could be one of the reasons why you are unable to connect to the Internet. To resolve this, it is recommended that you set your computer to obtain an IP Address automatically. To know how to do this on a Windows® 8 / 8.1 or 10 click, here. For Windows® 7 computer, click here. 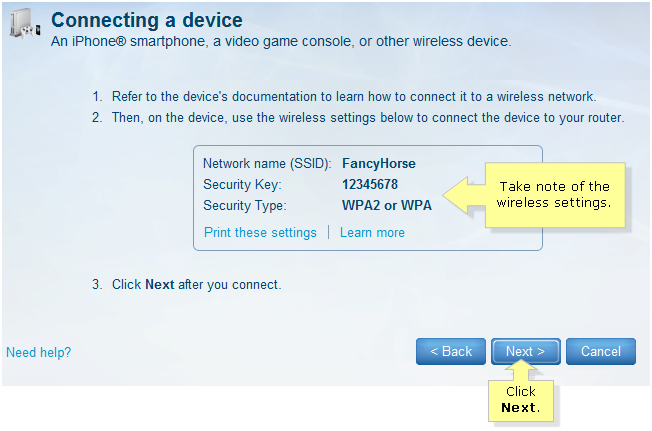 The Linksys Connect software can also be used with Linksys Smart Wi-Fi Routers (EA2700, EA3500 and EA4500) using the Classic firmware. However, these routers may also be upgraded to have Linksys Smart Wi-Fi.